TORONTO — The Toronto Raptors are hoping Kawhi Leonard's fourth-quarter performance was a sneak preview of what they'll see from their star player in the post-season. "We've been seeing that, slowly," Fred VanVleet said of his teammate. "The urgency has been creeping up, a little more fire." Paul George scored 28 points, while Russell Westbrook had 18 points, 13 assists and 12 rebounds, and Dennis Schroder chipped in with 26 for the Thunder (43-30), who snapped a four-game losing streak. Pascal Siakam had 25 points for the Raptors (51-22), who were missing all-star guard Kyle Lowry. Danny Green had six three-pointers and 19 points, while Serge Ibaka scored 11, and Norm Powell grabbed 11 rebound for the Raptors (51-22). Will the Raptors see still another gear from Leonard from the ball is tossed up for the post-season? "That's what we hope," said Green, who played with Leonard in San Antonio. "Obviously he has played at a high level in previous years before this year and in the playoffs and we hope he can reach that level or get back to that level and play at that level in the playoffs for us. "We hope that everyone else plays at that level. Marc (Gasol) has had some great playoff runs. Serge has had some good ones. We are going to need everyone to come up and play their playoff basketball." Playing the second game of the back-to-back series, and their final game of the regular season against a team with a winning record, the Raptors led for most of the night, but saw their 13-point third-quarter advantage evaporate with 20-3 Thunder run. 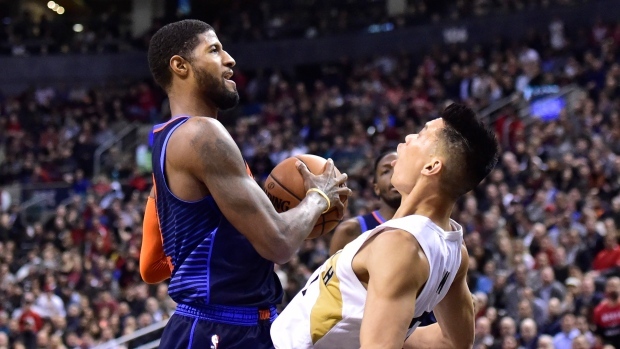 The Raptors regained the lead briefly in the final frame, but consecutive three-pointers from George and Schroder — two of the 20 the Thunder had on the night — put the visitors up by 10 points in front of a capacity Scotiabank Arena crowd of 20,014. "I liked the force he was playing with offensively, right?" the coach said. "He did shoot 10 free throws which might be a record for this year but he could have shot another 10, to be honest. He was really getting jolted around on drives and hit a lot. They made him play through a lot of it and I thought he did, for the most part." "You look down (at the box score), we shot 50 per cent, 52 per cent from three, 85 per cent from the line and you think, 'How are you not winning that game?'" Nurse said. "Then you look over at the turnovers, 22 of them, we had eight in the first quarter and still were in good shape." Nurse said there's no structural damage, only soreness. "I think we're saying next week some time and day-to-day all in the same sentence," he said. "Just whenever that soreness goes away and he feels like he's ready to go, he's ready to go."